This new image from the MUSE instrument shows never-before-seen galaxies in stunning 3D. The Hubble Space Telescope also imaged this patch of sky in the 1990s. Image released on Feb. 26, 2015. Astronomers have just released a brand-new, best-ever 3D view of the deep universe, and it's a doozy. The amazing new photo, released by the European Southern Observatory (ESO) today (Feb. 26) reveals never-before-seen cosmic objects in a relatively small patch of sky. 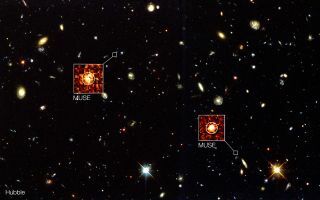 The MUSE instrument on ESO's Very Large Telescope in Chile spent 27 hours staring at the Hubble Space Telescope's Deep Field South region, helping scientists learn more about far-flung galaxies. You can learn more about the photo in a video about the amazing 3D view of the universe as well. "After just a few hours of observations at the telescope, we had a quick look at the data and found many galaxies — it was very encouraging," Roland Bacon, principal investigator of the MUSE instrument, said in the same statement. "And when we got back to Europe we started exploring the data in more detail. It was like fishing in deep water and each new catch generated a lot of excitement and discussion of the species we were finding." Hubble took its first deep-field image in 1995, and since then, it has taken other images of the distant universe, revealing more newfound galaxies along the way. The Hubble Deep Field South image was captured over the course of 10 days in 1998, giving scientists and the public a new view of galaxies in the deep universe. MUSE has now revealed more than 20 extremely faint objects not seen in the deep-field image, ESO officials said. "The greatest excitement came when we found very distant galaxies that were not even visible in the deepest Hubble image," Bacon said. "After so many years of hard work on the instrument, it was a powerful experience for me to see our dreams becoming reality." In this annotated image, triangles represent objects newly discovered by MUSE. White stars represent faint Milky Way stars, and circles are objects seen by the Hubble Space Telescope. Blue objects are relatively nearby, with green and yellow ones more distant. Pink and purple objects represent galaxies seen when the universe was less than 1 billion years old, according to ESO. The galaxy distances measured by MUSE were varied, according to ESO. Some formed relatively recently, while others "were seen when the universe was less than one billion years old," ESO officials said. Astronomers are now planning on training the instrument's gaze on other parts of the sky, originally images captured by Hubble. "Now that we have demonstrated MUSE's unique capabilities for exploring the deep universe, we are going to look at other deep fields, such as the Hubble Ultra Deep field," Bacon said. "We will be able to study thousands of galaxies and to discover new extremely faint and distant galaxies. These small infant galaxies, seen as they were more than 10 billion years in the past, gradually grew up to become galaxies like the Milky Way that we see today."